An annual award &ldquo;to the goalkeeper(s) having played a minimum of 25 games (13 games in 2012-13) for the team with the fewest goals scored against it.&rdquo; Winners selected on regular-season play. History: The Jennings Trophy was presented in 1981-82 by the National Hockey League&rsquo;s Board of Governors to honor the late William M. Jennings, longtime governor and president of the New York Rangers and one of the great builders of hockey in the United States. Frederik Andersen and John Gibson of the Anaheim Ducks won the William M. Jennings Trophy. The Jennings race was not decided until the final game of the season. The Ducks traveled to Washington with a one-goal deficit in the competition - Washington with a league-low 191 goals-against, Anaheim with 192. Andersen and Gibson won the Jennings when the Ducks, behind Andersen&rsquo;s 24 saves, blanked the Capitals 2-0, keeping their goals-against total at 192 and pushing Washington&rsquo;s to 193. Andersen and Gibson are the first Ducks goaltenders to claim the Jennings Trophy. Andersen made 43 appearances in the Ducks&rsquo; goal, posting a 15-game point streak from January 1 to March 5 (13-0-2) - the second-longest such run in franchise history behind Jonas Hiller&rsquo;s 16-game streak in 2013-14 (14-0-2). He went 17-1-2 in his final 22 outings dating to January 13 and was 22-9-7 overall with a 2.30 goals-against average. Gibson appeared in 40 games and ranked second in the NHL with a 2.07 goals-against average, paced all rookie netminders with four shutouts and shared the rookie lead with 21 wins (21-13-4). Until the 1980&ETH;81 season, the Vezina Trophy was awarded to the goaltender(s) of the team allowing the fewest number of goals during the regular season. However, it was recognized that this system often meant the trophy went to the goaltender of the better team rather than the individual and hence the change was made to offer the Vezina to the most outstanding goaltender, as voted by the NHL General Managers. 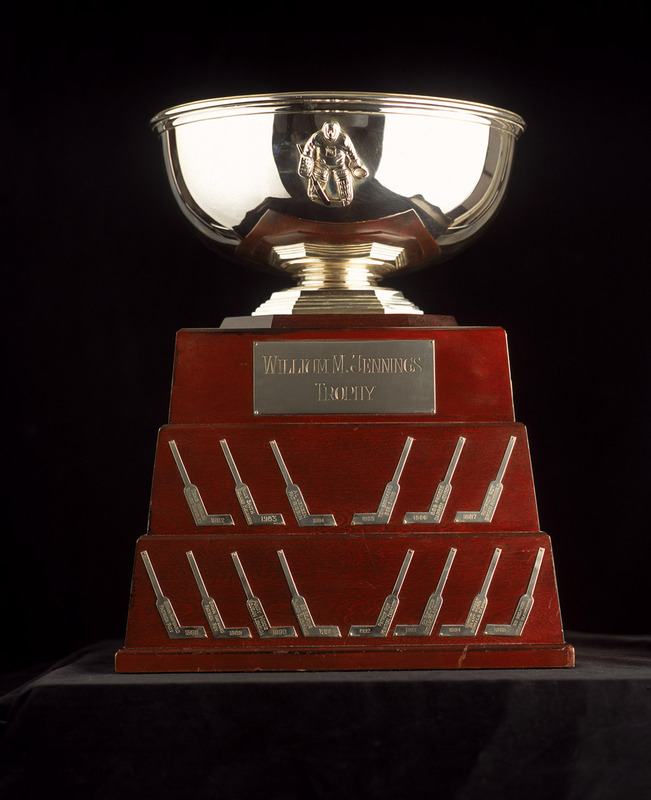 The William M. Jennings Trophy was created as a replacement and is awarded to the goaltender(s) playing for the team with the fewest goals against.